Automate your entire production line or choose an industrial automation system for a specific process to enhance quality, speed up inspection, improve accuracy and decrease costs associated with labor, energy, and materials. CIMTEC’s expert consultants will help you determine the best industrial automation pathway to suit your production and budgetary requirements. With CIMTEC's expertise and comprehensive knowledge of the products we utilize in our automation solutions, you can choose to move your facility into full automation all at once or step-by-step. And you can be sure that you are using the technology that is best for your unique needs. 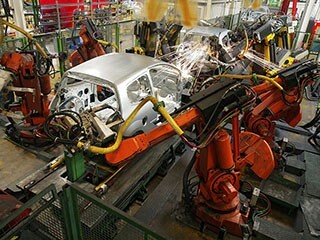 Contact us for expert advice on getting the right industrial automation systems to suit your needs and budget. to an engineer that can assist you.